We welcome all ages in our worship and life together – including the energy and noise that some of God’s smaller children may bring! We know it can be hard for families with babies or small children to come to worship. We hope you will, though, and we invite you to make use of our staffed nursery for children 0-4 during that time. Prefer to keep your kids with you, or have older kids? We also have worship activity bags to keep them engaged and help them worship along with adults. Children and youth can also participate in church life in many ways: as acolytes, Scripture readers, AV assistants, or other tasks. Periodically we have service events after worship in which all ages can participate, and youth 14 and older may serve on our annual summer mission with Appalachia Service Project. As United Methodists, we believe that God’s grace is at work in our lives before we even know it. 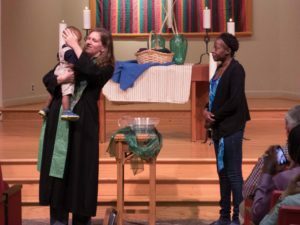 We baptize babies and children (as well as adults who have never been baptized before, of course!) When children become old enough to make a commitment to follow Jesus themselves (ages 12 and older), we provide a confirmation class to teach them how to become disciples of Christ for the transformation of the world.